IFLA Europe /Landscape Institute Conference and General Assembly, 6-9 September 2018. Presented by the Landscape Institute, IFLA Europe and the University of Greenwich IFLA Europe /Landscape Institute Conference, 6-7 September 2018. Landscape’s greatest value is in how it connects people, the places we create, and the environment we inhabit. 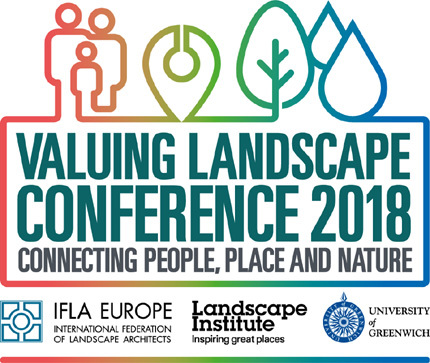 Measuring and demonstrating the benefits of landscape interventions will be of crucial importance in the years ahead.The LI, in partnership with the University of Greenwich Department of Landscape, is holding its 2018 conference in tandem with the IFLA Europe General Assembly. Join us on 6-7 September for two days of debate, discussion, bold thinking and creative ideas led by a world-class roster of international speakers. This entry was posted on Monday, July 23rd, 2018 at 11:43 and is filed under conference, congress, landscape, news, paisea, without category. You can follow any responses to this entry through the RSS 2.0 feed. Both comments and pings are currently closed.